The trip started at A. Bonifacio highway between Quezon City and Caloocan. 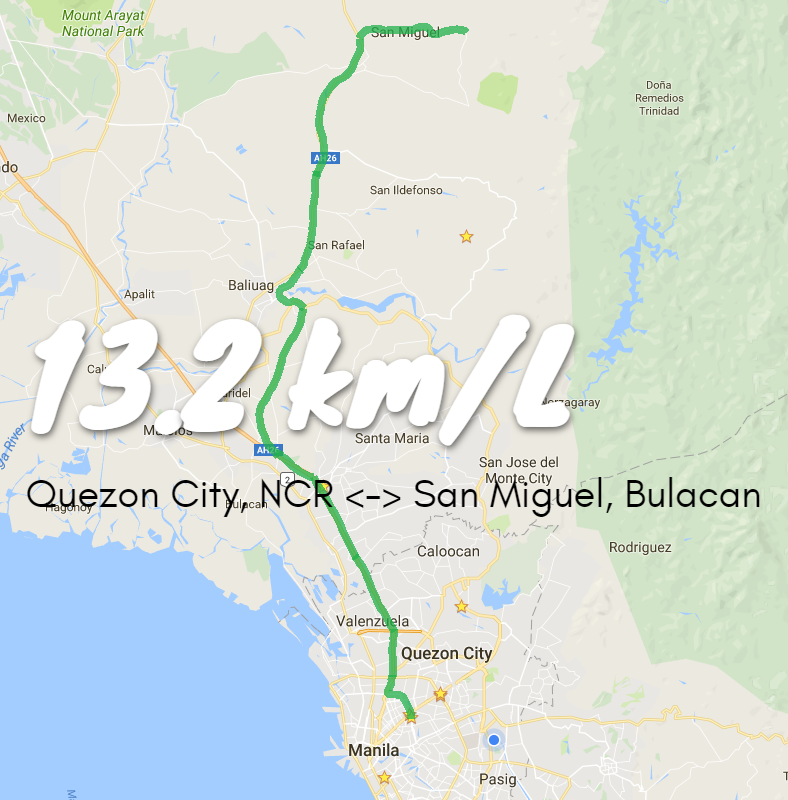 The route runs through Balintawak, NLEX, then Plaridel Bypass Road up to Bustos Bulacan. We went to inner roads from Bustos to be able to get out to San Rafael Bulacan's part of Pan Philippine highway. We followed the road until the intersection of Camias-Sibul road, turned right from there and drive for 15kms more before arriving at the destination. We followed the same route on way back to Metro Manila. We have 1 stop-over at SM Savemore San Ildefonso to buy some pasalubongs. It's a 170+ km trip consuming almost 13L of fuel. That translates to 13.2km/L, far from the very optimistic result of 22km/L I got on my Insane Highway efficiency test a week ago. It was actually a nice drive yesterday. We had a continous trip up to the end of Plaridel Bypass Road. I can say we are on the range of 80-110 km/h on average. After that the trip becomes slower due to the single lane and more vehicles on the national road 30-40km/h on average from San Rafael up to San Miguel. It took us 2 hours and 10 mins for a single trip. 1 hour and 50 mins on way back. I'm excited to cover longer distances soon. Bro, hows ur tucson? You dont update anymore?